Humanity has always endeavoured to speed up manual tasks. From the first use of animal ones as tools to the creation of the factory production line, we have always wanted to make things better, faster and cheaper. But each iteration of automation has led to fears that tireless, easily replaceable machines will do away with human work. Now a new report from the McKinsey Global Institute has highlighted how it thinks a range of jobs based on human skills are likely to be affected by AI and automation. 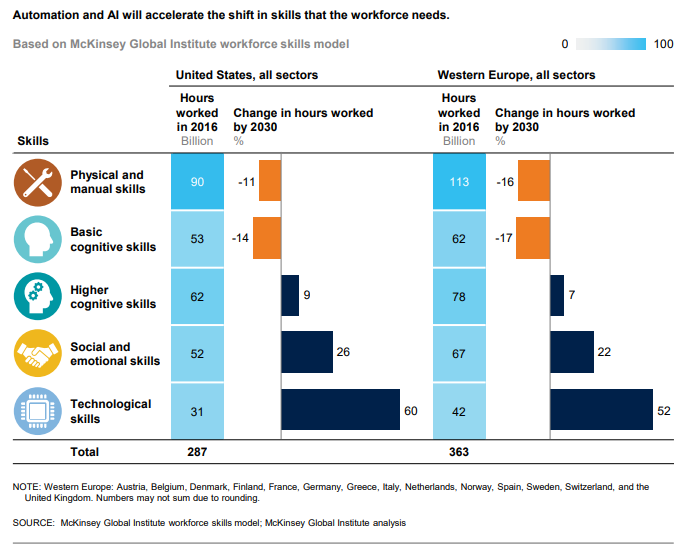 The study also emphasizes the top three skill sets McKinsey says workers will need to develop between now and 2030 if they do not want to be “left behind”. The report places work skills into five distinct categories: physical and manual; basic cognitive; higher cognitive; social and emotional; and technological. Workers use a range of these capabilities across a wide field of jobs. So physical and manual skills encompass tasks that could be performed by relatively unskilled labour, such as drivers and assembly line workers, as well as skilled workers, including nurses, electricians and craftspeople. Cognitive abilities like basic literacy and numeracy are needed by workers such as cashiers, customer service staff and those involved in low-level data input and processing, such as typists and clerks. But the report says that it is predominantly workers with these two skills sets who are likely to suffer most, although not in every profession. 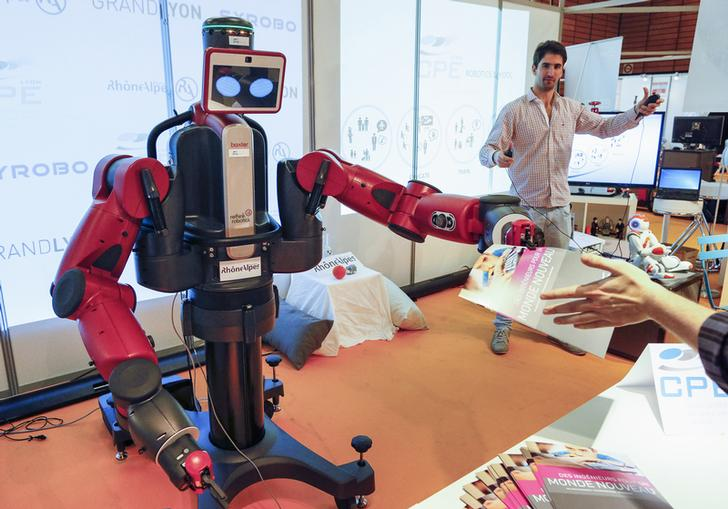 Nonetheless, a wide variety of tasks currently performed by people specializing in such skills in the US and 14 Western European countries are likely to be automated, McKinsey found. Physical and manual workers in the US were likely to see a decrease of 11% from the 90 billion hours worked in 2016, while Western Europe’s 113 billion hours would be reduced by 16%. The number of hours devoted to basic cognitive skills in the US was 53 billion in 2016, with 14% fewer needed in 2030, and Western Europe’s 62 billion hours would be cut by 17%. Higher cognitive: these skills include advanced literacy and writing, quantitative and statistical skills, critical thinking and complex information processing. Doctors, accountants, research analysts, writers and editors typically use these. Social and emotional, or so-called “soft skills”: these include advanced communication and negotiation, empathy, the ability to learn continuously, to manage others and to be adaptable. Business development, programming, emergency response and counselling require these skills. Technological: this embraces everything from basic to advanced IT skills, data analysis, engineering and research. These are the skills that are likely to be the most highly rewarded as companies seek more software developers, engineers, robotics and scientific experts. By 2030 there will be huge demand for higher cognitive skills such as creativity, critical thinking and decision making. They add: “Demand for higher cognitive skills such as creativity, critical thinking and decision making, and complex information processing, will grow through 2030 at cumulative double-digit rates. 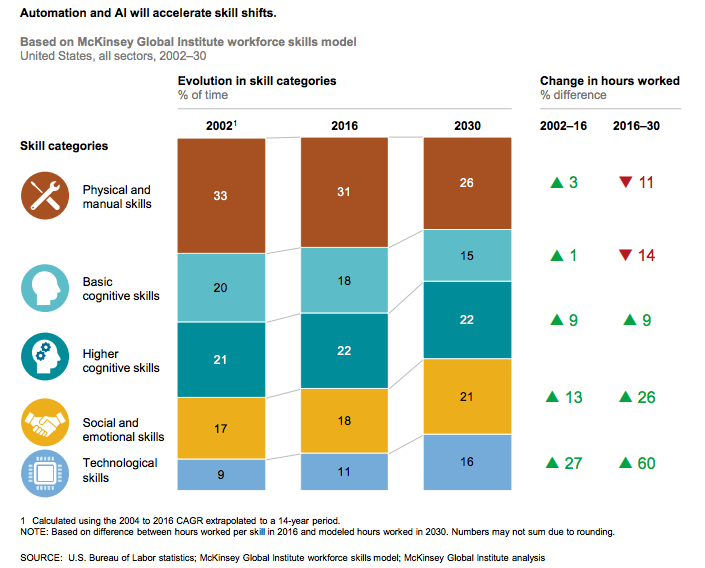 Demand for higher cognitive skills in the US in 2030 will rise 9% above the 62 billion hours recorded in 2016, and the 78 billion worked in Western Europe would notch-up a further 7% in the same period. Meanwhile, the call for social and emotional skills in the US will rise by 26% above the 52 billion hours seen in 2016, and Western Europe’s would increase by 26% above the 67 billion of two years ago. But it is workers with technological skills who, by 2030, will experience the biggest proportional increase in the demand for their time: a rise of 60% above the 31 billion hours worked in 2016 in the US and a 52% increase on Western Europe’s 42 billion hours.